How does sunscreen work is a question far more complicated than at first imagined. Understanding this helps in knowing how important it is to use a healthy sunscreen to avoid the ever increasing occurrence of skin cancers. The cancer statistics presented mean we can't afford to ignore the warnings, especially if you are a skin type one with fair skin with blue eyes! But the darker skins are not immune. Then there is the added factor of Vitamin D. How do you get outdoors to embrace the sunshine enough to create Vitamin D, but not be at risk for skin cancer? 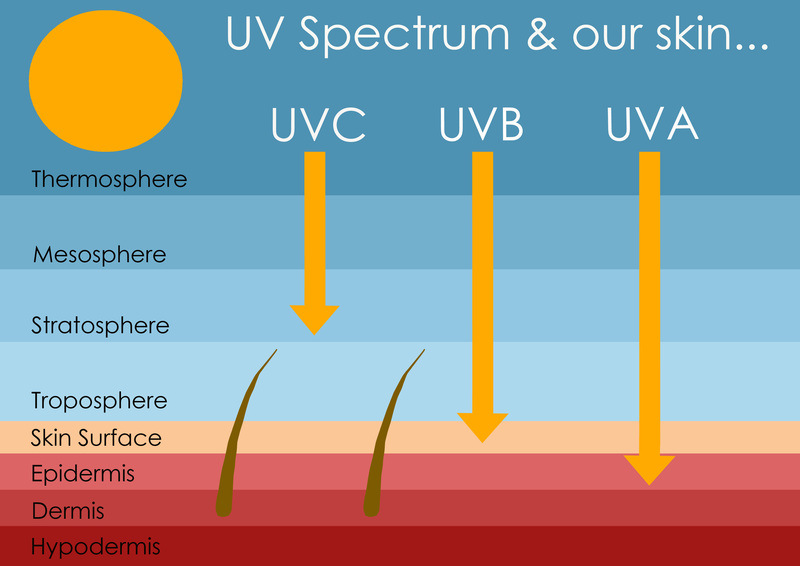 How does sunscreen work within the UV spectrum? Most people use a sunscreen so they won't get sunburnt. However, I believe the essential purpose of a sunscreen is a little more complex in that it needs to prevent us from being exposed to the sun's UV rays and incurring any DNA damage that can lead to the dreaded skin cancer. Although sunshine is hugely important to all living creatures on earth in one way or another, too much too quickly can be detrimental. As you can see in the diagram above, the sun's rays consist of many different types. It is the Ultra Violet (UV) photons that sunscreens focus on preventing from damaging our skin. These UV photons are shorter in wavelength and higher in energy than visible light, and being outside the visible spectrum, we are not able to see them. When these high-energy UV photons strike your skin, they generate free radicals, which unless controlled by your natural built-in defence systems, can ultimately damage your DNA, prematurely age your skin, and possibly result in skin cancer. How does sunscreen work with all the UV rays? The UVB and UVA rays reach us on earth but the UVC rays are stopped at the ozone layer, -although the depletion of upper atmospheric ozone has people debating whether or not the UVC rays do actually reach us? The shorter wavelength UVB rays don't penetrate as deeply into our skin as the UVA rays, but are known to be the primary cause of sunburn. The longer wavelength UVA rays penetrate deeper into the layers of the skin, where they are known to be the ones responsible for the premature aging of the skin and immunologic problems. Both produce free radicals and through significant damage to the DNA, can ultimately cause skin cancer. Thus sunscreens are required not only to protect us from both the UVA and UVB rays, but also from free radical damage. So, how does sunscreen work - actually? Also called inorganic, physical or mineral sunscreens. These officially number anything from 17 - 25 depending on which country you are in. They include octyl methoxycinnamate (OMC), 4-methylbenzylidene camphor (4-MBC), avobenzone, oxybenzone, and homosalate amongst others. Both the natural and chemical types protect against UVB rays (280- to 320-nm range). Both of the natural mineral ingredients protect against both UVA and UVB rays (280 400 nm range). A small number of the chemical (organic) ingredients also protect against a portion of the UVA ray range (320- to 400-nm). 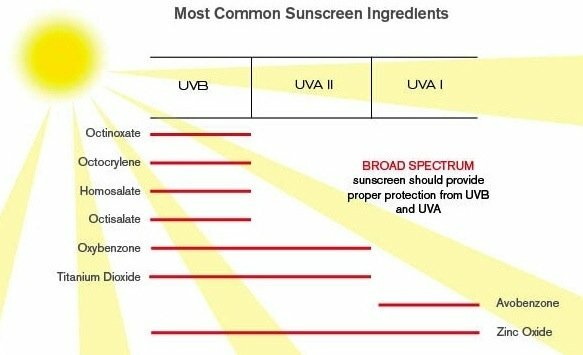 As the diagram illustrates, Zinc oxide provides by far the widest spectrum of protection of all the sunscreen ingredients. Formulators often combine the mineral and chemical sunscreen ingredients for a synergistic effect. This is how it is possible to achieve very high SPF (sun protection factor) ratings. However, SPF is a measure of how effectively a sunscreen limits skin exposure to the UVB rays only. SPF does not measure the protection provided against UVA radiation. Some sunscreens will say their products contain "broad-spectrum" protection, which means they provide protection against both UVA and UVB rays, but the level of UVA protection is not indicated. UVA certification methods are varied across the world, with no one single method having been identified as a global standard, as with the SPF for UVB. However, it is important to find a sunscreen that does at least have some sort of certification for their UVA protection to make sure it is high enough. Can Biomimmicry show us how sunscreen could work? Researchers in many different disciplines are looking increasingly towards nature for solutions to a variety of things. There is even a science that has been called Biomimicry that focuses on this and it is evolving fast. One individual we can thank for the global popularity of biomimicry, is Janine Benyus. She believes the essence of it is "actually a new way of inventing. And so, chemists and designers and architects and engineers, when they have a problem, they ask, 'What in nature has already solved this problem?' The core idea is that life's been in Earth 3.8 billion years and that's a lot of R&D." Looking to nature, we are able to discover many incredibly sophisticated solutions to our human needs. This includes more effective, natural and non-toxic sunscreen ingredients. Some interesting examples in nature of natural defences against the damaging rays of the sun are cited below. 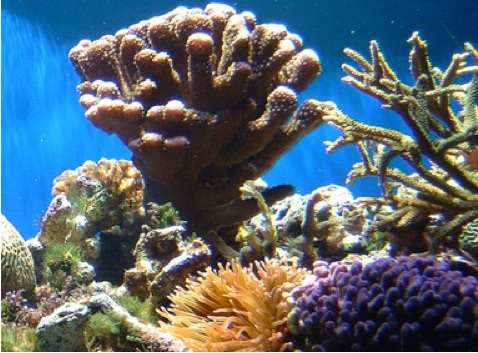 How does sunscreen work in Corals? How does a sunscreen work with respect to a mushroom coral? It is known to secrete a mucus to protect itself from the sun's UV rays when exposed, so research is being conducted to harness this. The coral is shown below. Other studies with coral illustrate some answers to the question of how sunscreen works in nature and suggest that most corals have a natural ability to act as a sunscreen by absorbing the UV light to limit the harm it inflicts on the reef's denizens. This is different to the warming of the oceans being experienced recently, that are seemingly causing the coral to bleach and die. 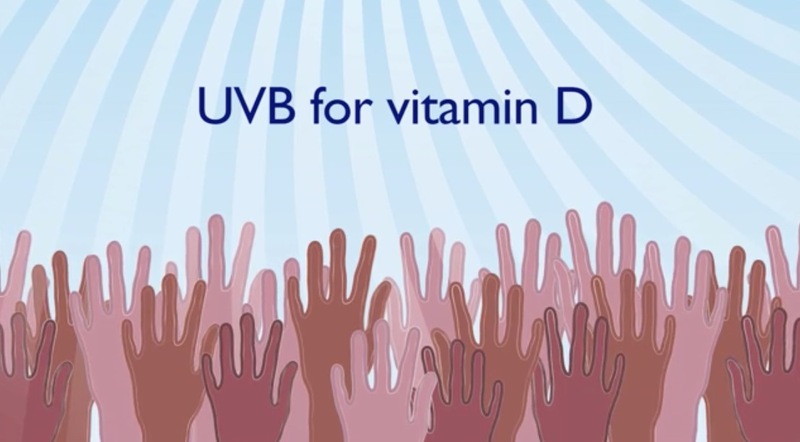 The research is looking into how they effectively defend themselves from UV damage. How does sunscreen work in ivy? A very interesting study was done on "Naturally occurring nanoparticles from English ivy: an alternative to metal-based nanoparticles for UV protection" by the Department of Mechanical, Aerospace and Biomedical Engineering, University of Tennessee, Knoxville, TN, 37996, USA. Besides it's tested photo-protective capabilities, they speak about "the adhesive effect of the ivy's nanoparticles allowing the ivy nanoparticles to remain on human skin for a longer period of time, thus enhancing their UV protective effect." They concluded "with the data collected from this study, we have demonstrated the great potential of ivy nanoparticles as a sunscreen protective agent, and their increased safety over commonly used metal oxide nanoparticles." How does sunscreen work in Algae? Yet another example from nature is the single-cell alga called Dunaliella Bardawil, that thrives in the Dead Sea and the Sinai desert. It produces a yellow-orange pigment that shuns any excess light which could interfere with its photosynthesis process - effectively acting as a sunscreen. Researchers continue to try to gain approval for the many uses of natural ingredients in sunscreen formulations and I am sure we will see many more being highlighted and used in formulations as science turns more and more to how much nature has to teach us. 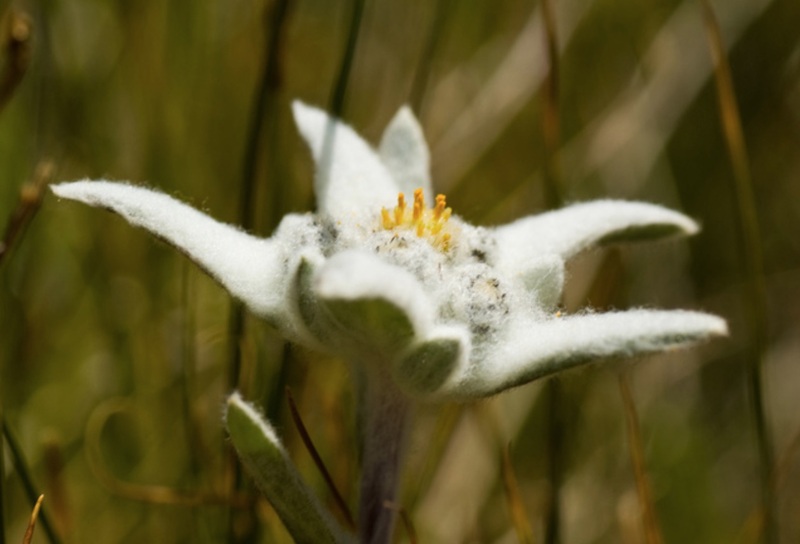 How does sunscreen work in Eidelweiss?